There has been no assault on Lugansk as such. Following an unsuccessful attempt immediately to take Khryashevatoye, where street battles unfolded, a part of the advancing forces went on to flank the village and entered the suburbs of Lugansk from the south, and that is where sporadic clashes started taking place because here the factions did not have troops sufficient for taking control over southern suburbs. 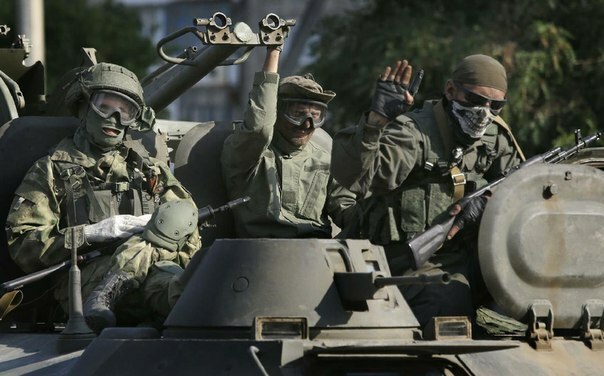 The Junta reported that it occupied a part of Lugansk, while the LPR Army reported that it was sweeping and purging the Junta infantry that seeped into the city. In reality, here there are ongoing urban battles of medium intensity, as the sides do not have that much heavy weaponry in this area. Overall, here there is no direct threat to Lugansk. The highway in the area of Novosvetlovka at this time has not been fully unblocked. The LPR Army continues its attacks, but is unable to knock the enemy out completely yet. The expectations that it would be possible to drive the Junta away from the highway in two days turned out to be too optimistic, and it is clear that far more significant efforts will need to be made here. The convoy is stopped first and foremost because there is no physical way to get to Lugansk. That is the cause of the fierce attacks on Novosvetlovka by the LPR Army. The question of completely unblocking the highway has not only military, but also political significance. Yesterday in Stanitsa Luganskay there were street battles. The Junta traditionally hung its flag somewhere and declared the town was taken; however, street fighting continued. Militiamen retreated to the dominant height nearby the settlement and closer to the evening returned to the town and resumed fighting. It cannot be said at this time that the town is controlled by either of the factions. In principle, given the configuration of the front line, Stanitsa Luganskaya has little effect on the possibility of encirclement of Lugansk or on the fight for the border. However, having suffered a number of failures, the Junta desperately needs at least some victory, and yet, even here, it is unable to achieve success. By the looks of it, here we can observe an attempt to change the tactics of the punitive operation in the LPR in accordance with Poroshenko’s statement, involving, specifically, the resumption of battles aimed at taking control of the border. In the medium term, in the event Stanitsa Luganskaya is taken, the Junta may attempt to resume its offensive on Izvarino from the north. The Junta’s prospects here are very vague in light of the catastrophic failure of the last such attempt. [Note: latest information indicates that Stanitsa Luganskay was not taken and that the Ukrainian army was driven out of the town]. In the area of Alchevsk and Stakhanov, the LPR Army firmly holds key positions. Notwithstanding the Junta’s lies, Pervomaisk continues to remain under the Militia’s control. The city is constantly being shelled, but direct attacks against it remain unconvincing. It appears that here the Junta does not have sufficient troops for more active operations. 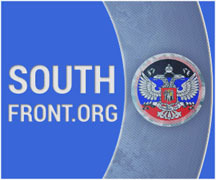 Judging by the resumption of active operations in the area of Stanitsa Luganskaya, some of the troops that were freed up after the Lisichansk Protrusion was cut off were redeployed to the northern front of the LPR in order to create an assault group, which is now advancing on Stanitsa Luganskaya. In the area of Debaltsevo, sluggish combat operations continue, fettering some of the Junta’s forces. These maneuvers enable further activities aimed at defeating the surrounded 30th Mechanized Brigade. Here the Militia does not have large forces sufficient for an assault on Debaltsevo, and the enemy has a serious advantage in armoured vehicles and artillery. The Lugansk airport is still blockaded, something which is confirmed by both sides. The resumption of hostilities in other sections of the front has permitted the Junta to shoot some video at the location. The LPR Army’s artillery is now engaged in other areas and is not particularly concerned about the airport at the moment. 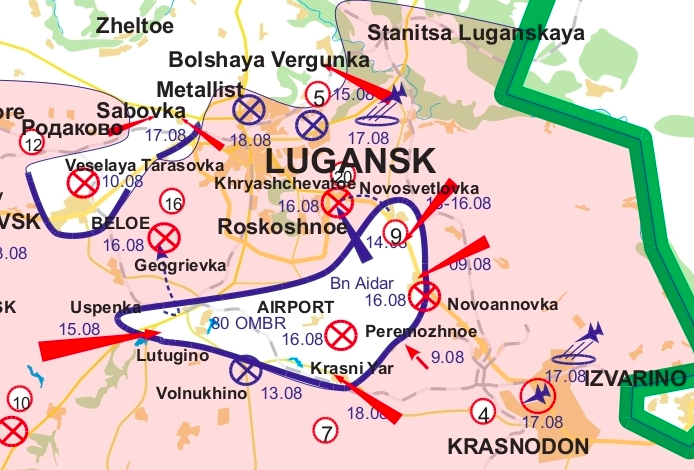 The fact that the airport still has not been swept, like the Southern Cauldron, both very clearly demonstrates the shortcomings of command in Lugansk and indicates a certain lack of forces to liquidate the cauldron that has existed there for almost two months. Overall, the operational crisis to the southeast of Lugansk continues, and the tactical outcomes of the battles near Novosvetlovka, Khryashevatoye and in the southern suburbs of Lugansk will determine the long-term operational, strategic and political consequences. 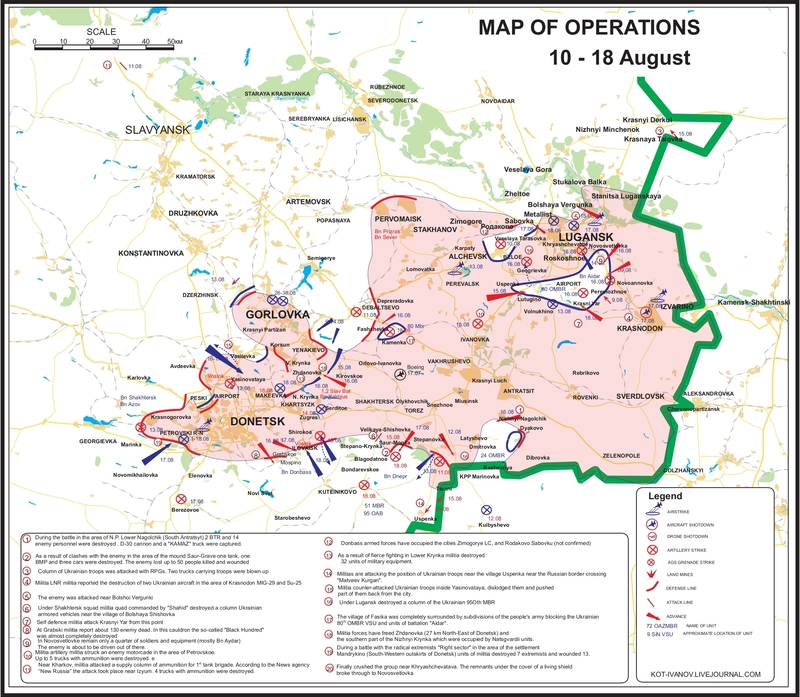 The offensive to the south of Donetsk continues; however, the Junta remains unable to take Ilovaisk and Mospino. And this is despite the fact that the main forces of the DPR Army that were freed up after the victory at Miusinsk and Krasniy Luch were thrown at the encirclement of the Southern Cauldron 2.0 and repulsion of the Junta’s offensive on Yasinovataya and Enakievo. Making use of its over superiority in troops, the Junta is attempting to flank Ilovaisk and Mospino, which have been in semi-encirclement for the past two days. In the suburbs there is ongoing fighting. The enemy is actively using both rocket and cannon artillery. The situation is difficult because here the DPR Army has very few reserves, which are otherwise involved in other areas, even though here there is an urgent need to enter into battle several batteries of howitzer or MLRS and 10-15 tanks. 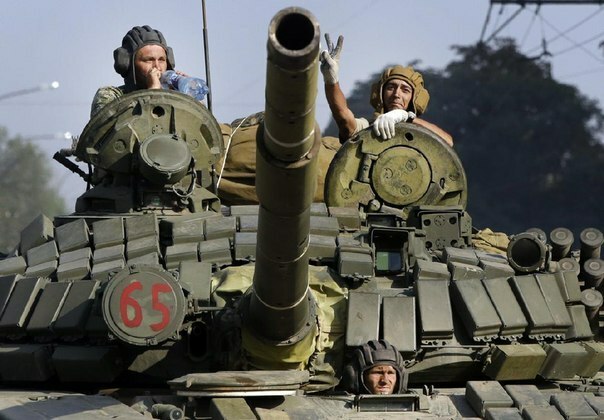 The Junta’s offensive on Yasinovataya has once again disgracefully chocked. The Junta was driven out of the town and, in addition, yet another “victory flag” was burned on video. This key centre is necessary for an offensive on Donetsk from the north, and it continues to be retained by the DPR Army, just as before. Significant help to the Yasinovataya garrison was provided by the forces redeployed here from Krasniy Luch and Miusinsk. The forces managed to stop and drive the enemy back. Here the enemy is expected to regroup and to resume its offensive. Having safeguarded the area of Miusinsk and Krasniy Luch, the DPR Army now uses this area to maneuver its few reserves along the internal lines of communication. The exacerbation of the crisis in the area of Zhadnovka, as well as the strengthened shelling of Makeevka and Khartsyzsk will require the concentration of additional forces here in order to stop the Junta’s offensive in this area. 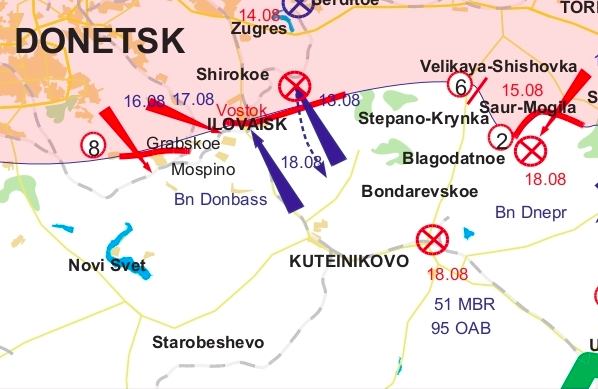 For now, the Junta does not have sufficient troops here for a further offensive; however, the strengthening of the artillery fist in this area suggests that in the course of 2-3 days there may be a new strike here directed toward the highway that passes through Torez to Donetsk. It is possible that the Junta, having suffered a failure at Shakhtersk and Krasniy Luch, will make a third attempt to cut off the DPR from the LPR. Nevertheless, at this time the communications between the Republics along this key highway are preserved. Overall, there have been no significant changes in the second edition of the Southern Cauldron. The resumption of the battles on the approaches to Saur-Mogila indicates that here the DPR Army is trying to avoid the Junta taking complete control of the height and that it is fettering the enemy reserves that the Junta could otherwise use to unblock the Southern Cauldron 2.0. The enemy remains unable to surround Gorlovka or to take Enakievo, but the corridor that leads from Donetsk to Gorlovka is now quite narrow, so the Junta is conducting obvious operations aimed to cutting off the Gorlovka Protrusion. The main strike is being made from the side of Uglegorsk and to the north of Panteleimonovka, which according to some information is under the Junta’s control, while other sources indicate that it is controlled by the DPR Army. 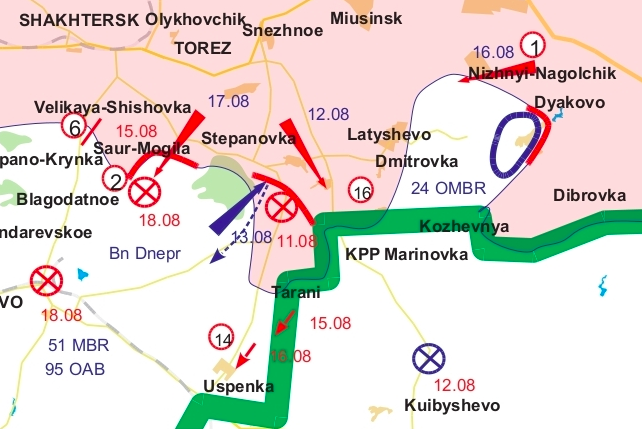 In general, it is in this sector that the DPR Army faces maximum risks because, in the event the Gorlovka Protrusion is cut off, substantial Militia forces would be left encircled, and the Junta would then obtain its much-desired local victory that would substantiate the continuation of the bloody madness. Donetsk itself is controlled by the DPR Army, and any frontal assault from the western direction is hardly possible, while in the north and in the south the Junta is mired in battles for Ilovaisk and Yasinovatay. In general, the city continues to be showered with shells and rockets, and this shelling is obviously terroristic in nature and are aimed at extermination of the civilian population and is aimed at hastening the humanitarian catastrophe. Overall, taking into account the losses and the personnel rotation, the Junta currently has in Donbass the following battle-worthy forces: 48-52 thousand personnel, approximately 550-600 armoured vehicles, up to 270 artillery units and MLRS, up to 15 airplanes and 5-10 helicopters. The Militia has approximately 19-23 thousand personnel, up to 130 various armoured vehicles and approximately 50 different artillery units and MLRS. Despite the continuing overall superiority of the Junta in manpower and military hardware, the ratio of forces is gradually equalizing and no longer indicates a blatantly disastrous situation for the Militia, such as it was in June and July. It is this progressive change in the ration of forces that explains the growing bitterness and tenacity of fighting in practically all the directions. The front line that the Militia has to deal with has narrowed, while the density of its forces has grown, and, as a result, the Junta has fewer and fewer opportunities to attack unprotected areas while evading frontal strikes. It should be noted that, despite Kurginyan’s tantrums and predictions that, after withdrawing Slavyansk, the Militia will soon abandon also Donetsk, it has now been over a month that the city of Donetsk continues confidently to repulse the Kiev Junta’s offensive, which it is pursuing with maximum possible effort. This, unquestionable, is the achievement of Strelkov, who saved the capital of the DPR from being surrendered to the Junta when he timely withdrew from Slavyansk to Donetsk and organized the defense on the approaches to the city. Essentially, the fact that for over a month now Donetsk has been fettering the enormous forces of the Junta once again demonstrates how correct Strelkov’s decision was. He made it possible not only for the DPR to be saved, but also for the first Southern Cauldron to be created. And it is the Southern Cauldron that now is one of the main suppliers of armoured vehicles and military hardware to the Militia. In general, the Militia at this time needs to drive the Junta out of Novosvetlovka, retain Yasinovataya, Ilovaisk and the corridor to Gorlovka, and also to knock the enemy out of Zhdanovka. At the same time, it will also need to find the troops to complete the liquidation of the two surrounded enemy brigades located to the south of Krasniy Luch. And what is most important, is that with every day there are more and more people who understand that this war will not be over in the summer of 2014 (unless some kind of sudden political decisions are made) and will continue in the fall – even though so many claimed that it would end in May, June, July, then August. This war will not be over right away, this horror, just as in Yugoslavia, will drag on and on. And yes, you should be getting ready to collect autumn and winter clothing for the Militia. It is very likely that it will be needed. The UA resuming a coordinated attack on Stanitsa Luganskay and(I think) on to Izvarino as this is where the AID convoy FUP will be, for once through the Ukraine ‘customs'(that is why Kiev is stalling the convoy to give UA time) Izvarino is the first Conurbation that Aid comes to. That Aid will be a moral boost to the fighters and citizens(even if it is tiny in amount) that is why UA&Kiev will do everything to stop its arrival! Thank you for a concise report ! Thanks for providing the Latin script maps and the detail views. It makes it so much easier to understand the ebb and flow of the positions. Yeah, really great product here. Looking forward to more posts. Is Ukrainian army ready to fight in winter weather? Isn’t winter a chance for the Militia to turn the tide in Donbass? how can we help the militia? Strelkov’s work is exemplified by the militia’s seamless scout and sabotage, ambushing and close RPG and small mortar devastation of tanks and columns that foolishly try to fight from inside armor. There are more and bigger militia units moving faster each day. The tactics Strelkov stressed are working to encircle and trap again the Ukies in multiple small boilers and perhaps another large one. Whetther Col. Strelkov is alive, dead, wounded, coming back or not, or behind the scenes, his prior work is still in play. God bless Igor. Thanks for the maps and for the daily updates. These negotiations and deals behind the militia’s back might just be an entrapment by Putin of the 5th Column and oligarchs. They cannot get the militia to go along with their treachery. Therefore, they are left exposed, trapped in conspiracy with the Kiev nazi-war criminals. Putin, thus marginalizes them with the public as “traitors” to the cause of Novorossiya, which is favored by the vast majority of Russian public. Putin may not be part of this negotiation just because he allows it. He often allows his political rivals and saboteurs to climb the gallow’s steps and put the noose around their own necks. He would have to accept half a loaf in this scheme. And Russia needs the whole loaf or it loses to the destabilization scheme of the anti-Russians in Washington and Brussels. The militia is closer to victory than negotiations are close to a trustworthy deal with Kiev and its sponsors. That is delusional to think you can trust the assassins paid to kill you to stand down. There is nothing in the deal for the other side. They are taking huge losses and are months from total disaster. Thanks again, @Gleb, for your consistent and hard work to give the ‘outsided’ world detailed information. Thanks, @Brabantian, those are enlightening essays as well … . If I try to ‘read’ the snippets of info I gathered in the Interwebs, I get the picture of an Ukrainian Army forced to pull back its units NOW, before being encircled and destroyed. This has happened in the Southern Cauldron, this is happening at Lugansk and this will happen at Donetsk too. Estimated losses of Kiev about more than 50% in manpower and equipment, quite devastating. This number is backed by opposing officers of the Ministry of Defense at Kiev. I can hardly imagine, how Kiev wants to continue this war by a 3rd wave of mobilization, facing growing anger and dissent of larger parts of the population and even some media. There is the possibility of 1) taking the chance to leave the scene of ongoing crime after dissolving the Rada or 2) further radicalization of ideas and methods, if this would be possible at all – I mean, the installation of an US-backed FASCIST MILITARY DICTATORSHIP. Which would be a path of self-destruction by killing lots more people beforehand. ALL the options for Kiev are depending on US/EU/IMF money. If the West is pulling the plug, the Kiev Regime collapses nearly overnight. And it might look like, that, as Bhadrakumar is hoping, the Obama Administration could collapse under the weight of recent events in Near and Middle East too. Too much conflict and money-sinkholes in a compressed timeline, even for ‘Superpowers’. So it’s a question of priorities for Obama right now, maybe, even a question of deescalation, of the support of Russia/Iran/Assad in the handling of the Iraque desaster. Regarding the role of Germany in the negotiations with Putin and Ukraine, I can only speculate, that my dear government is fearing the backfiring of a miserably failed destabilization strategy of US/EU/NATO on the soil of Germany – economically due to the unwanted Sanctions against Russia (costing jobs and money) and ideologically due to anger and dissent of growing parts of the German population who are feeling completely disinformed regarding the Ukrainian Civil War, International Politics and MH17 – people are really feeling like being caught between a refreshed Cold War with US/EU spying on the citizens to mark the ‘dissenters’ for future procedures. There is an uneasy remembrance of the German perspectives on becoming a nuclear wasteland in the 1980ies … . So, that’s why Foreign Minister Steinmeier (faceless ‘Social Democrat’) is quite helpless and shocked, defending his opportunistic handshakes with the Kiev Regime aggressively in the criticizing public. He just could have not imagined, that things would turn out THAT ugly and brutal. Yes, he is that dumb. Chancellor Merkel (conservative ‘Christian Democrat’) is much smarter, but also cunning. She does not like Obama very much, there is some serious discomfort with aggressive US spying on Berlin lately. I hope, Merkel is remembering, that she is a child of East Germany and liked her Free German Youth visits of Russian kids, learning the language of the ‘Brothers and Sisters of the German Democratic Republic.’ I mean, that’s part of HER heritage. There is a reason, why Merkel and Putin can talk to each other, despite her remarks about Putin living in ‘another world’. Typical for Merkel, she wants to achieve a compromise in the Ukrainian conflict very soon just to avoid harm for herself and her Party in public opinion of voters. I can assure you, that she will NOT think about the fate of the poor and powerless people in Ukraine, as she is not thinking about the Germans belonging to that social strata either – and if she is thinking about that, then not in a healthy and helping way, quite the opposite. It is said, that the ideas of austerity, propagated by Yatseniuk, are coming directly out of the offices of Berlin – and are the same brutal methods as used for Greece, where people are killing themselves because of hunger, literally. So, Berlin would feel quite discomfortably supporting a Fascist Regime in Ukraine, contradicting every prose of ethical obligation for Germany because of ‘History’ taught in German schoolbooks. And Berlin wants to make good business with Russia as it used to do some weeks ago. So, it might be, that Merkel will tell Poroshenko on Saturday: we will not let you down economically, but you have to stop this war immediately.